Samsung has introduced Galaxy Music smartphone .The GALAXY Music is designed to capture the hearts of music lovers who are also in the market for an affordable smartphone. Galaxy music runs on Android 4.0 (Ice-Cream Sandwich). The phone features dual front speakers and other music related features such as the SRS and Surround-Sound with SoundAlive2 enhancements. An embedded FM Radio with built in antenna, provides superb musical entertainment on the go. Samsung has added its usual features, including Touchwiz, Samsung Apps, Samsung Hub, and Music Hub. 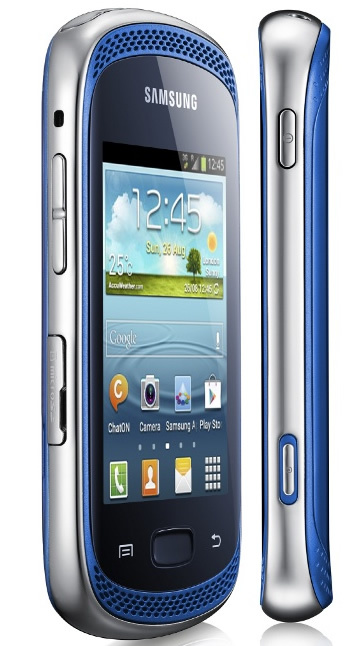 The phone will also come in a dual-SIM version packaged as the Galaxy Music Duos. Features like; RDS rich song and artist info, Music Square, Find Tag, Play Cast, Smart Volume, all add to the musical experience. The 4GB Internal memory is great and accommodates enough amounts of data, applications and content. It has 3 mega-pixel camera.